Everyday Fray: Blogathon Canada - Coming Soon! For the last couple of years, Judy of Sew Sister's Quilt Shop has been hosting a little diddy on the internet known as Blogathon Canada, and I'm happy to announce that it's coming back for its third consecutive year! I have loved following this hop in the past - finding new blogs to follow, meeting fellow Canucks with similar quilty obsessions, and last year I even won a prize! 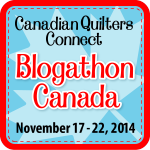 Like previous years, Blogathon Canada will run for an entire week from November 17 - 22th, and this year I have the pleasure of representing Alberta, hosting along side the incredibly talented Leanne from She Can Quilt on November 19th. I hope to see you all back here on November 19th for my stop on the hop, including a list of talented Alberta quilters to visit. If you are a Canadian quilter/crafter and are interested in participating in this years' hop, please do write to Sew Sisters at: connect@sew-sisters.com and they will add your blog to the list. The countdown to this years' Blogathon Canada is officially on! Wish I was a Canadian! Have fun everyone!